Elna Grasshopper – Ahead of its time! Recently, Pauline, the owner of our shop, discovered three green vintage sewing machines in army green metal cases. She discovered the machines as she was helping to move her elderly parents, Lou & Yvonne, the original owners and founders of Hamels Fabrics. Poppa Hamel was once a sewing machine dealer here in Chilliwack and along with his dear wife, Yvonne, started Hamels Fabrics. After they retired, the business was sold to their youngest daughter, Pauline, who has continued to build the shop into what we see today. Have you ever seen or heard of an Elna Grasshopper? This mighty little machine was originally designed in the late 1930’s and was in production from 1940 until 1952, and was one of the best selling sewing machines at that time. Fun Facts: The “Grasshopper” was the very first sewing machine that Elna produced and was Switzerland’s answer to America’s Singer Featherweight. Although these two models are similar in weight and portability, there are many distinct differences as well. The Grasshopper didn’t officially have a model number or a name but it’s colour and styling resembling and insect. It was the first mass produced portable free arm sewing machine, and gave the Singer Featherweight a run for its money! History: The Grasshopper was invented by a Spanish Civil War refugee named Ramon Casas, and mass produced in Geneva, Switzerland by the firm, Tavaro S. A. While the Grasshopper was not released for public distribution until 1940, it has actually been around since 1936. At the time, Europe was embroiled in World War II, and Tavaro was involved in manufacturing munitions. However, due to the Swiss policy of neutrality, the war related product line was eliminated. With the factory quiet, Tavaro shifted to making sewing machines and the world was introduced to the Elna Grasshopper. The Grasshopper’s efficient and functional metal carrying case was ideal for wartime. Right away when Pauline brought these machines into the shop to show us, I thought that the case looked like something from M*A*S*H 4077 (1970’s reference…) ! Whenever bombs were dropping, bullets whizzing through the streets and soldiers were marching through small towns, the Elna sewing machine was easy to pack up and compact, making it possible for refugees escaping the horrors of war to carry it as they fled to safe havens on trains and buses. When you first see the case, you aren’t sure what’s inside. Then after opening it up you are first struck by how cute the whole thing is… a little green sewing machine tucked inside. The machine itself looks kind of funny. There’s this metal thing hanging from it. At first glance, you aren’t sure if it is a hanging rod or some weird attachment. Upon further inspection, we realized it was a knee controlled replacement for the traditional foot pedal. The next thing that caught our attention was the fact that the fly wheel is at the bottom of the machine, not the top. The motor is located directly behind the fly wheel. It really looks a little funny, but very innovative for when it was made. The power switch is located on the very top of the machine. 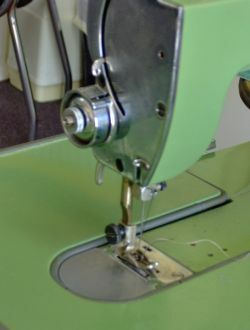 The light housed above the needle, giving the user the best possible illumination while sewing, a definite improvement over the Featherweight. The carrying case is functional in more ways than just providing a neat means of transport for the Grasshopper. It converts into a sewing table. Remember folks, this was 60 years before Sew Steady Tables came along! I’m not sure how many other portable sewing machine carrying cases have as many unique features, but this one has certainly got to be at or near the top of the list. With a case like this, you only need access to electricity to whip up a great outfit. You can literally open up an Elna Grasshopper and sew almost anywhere. Just imagine riding on a train, waiting in an airport terminal or sitting in a coffee shop and sewing away while sipping on your favorite cappuccino, zooming along the rails to your next destination or waiting for your flight to start boarding. The only drawback is that when you use the carrying case as a sewing table, you do not have access to the free arm or bobbin case. Threading the Elna Grasshopper is a simple process, but different from anything we had seen on other sewing machines. There are no onboard guides, like those found on today’s sewing machines, but if you are familiar with operating sewing machines at all, you can figure it out easily. Winding the bobbin is a little different from winding bobbins on other machines. The bobbin winding pin is located behind the balance wheel, attached to the motor axle. Unlike most machines, it is not necessary to turn the balance wheel before winding the bobbin. The trick to remember, though, is the machine will NOT sew if you leave a spare bobbin on the bobbin pin. The Elna Grasshopper is a straight stitch only sewing machine. The two step adjustable stitch length regulator is not the easiest to operate, but it works fine. Like many other straight stitch only machines, the stitches produced by the Grasshopper are neat and have that distinctive look about them. The Grasshopper stitches at the rate of about 500-700 stitches per minute. This is very good when you think of how small this machine is. It is also relatively quiet… which bodes well if you actually do decide to break out your Grasshopper and start sewing in a coffee shop or airport terminal. In fact, the carrying case and sewing machine are both in remarkably good condition – especially when you consider how old they are. One thing that really caused us to stop and take a second look is that the manufacturer not only recommends that a little bit of oil be put at several points all over the machine, users are also advised to add a little bit of kerosene near the bobbin shuttle. Kerosene is a highly combustible fluid and we are not so sure we would recommend its use, but the owner’s manual specifically states oil at some points and kerosene at others.For now, one of the Grasshoppers that Pauline rescued during the move is on display in the store. We think this little green guy deserves to be enjoyed and viewed out in the open to remind us of a bygone era and show us some historical Swiss ingenuity. We think he is kinda special! I learned to sew on one of these machines. It was my mother’s and my sister still has the machine. I loved that machine! Thank you for this fascinating insight into the amazing Grasshopper sewing machine. I appreciate how innovative it was for those times but am pleased that I don’t have to use it to make a quilt! I had one of these but it has been replaced over the years. Wish I had kept it. I still have a Singer featherweight. The stitching is really great for top stitching. We live a long way from the shop but I make sure we come by when we are in the area! Thanks for the history lesson! I have two of these but did not know the background..only bits and pieces! Thanks for sharing this wonderful story and some history of the Elna sewing machine. Thank you for sharing your unique piece of history. I thoroughly enjoy the history behind this little machine. I saw this type of machine at a sewing workshop, and later found one at a thrift store – kicking myself now for not buying it! Hope you enjoy your new-found treasure! What a. Interesting bit of history for us quilters. And I love all forms of European history, especially the w.w. two period. Oh! What a wonderful discovery! I’ve read about the Elna Grasshopper and how they actually helped refugees during and after the Second World War make a living and survive. I have an Elna SU vintage 1972, love it to bits, will never part with it. Please let me know if the Grasshoppers go up for sale. I’d be very happy to own a bit of history. That is so cool. I have heard of the Grasshopper but had no idea what it looked like or the history. Thank you. Thank you for the story on this little gem. I love my Elna Q7200 so I can understand how someone would love the Elna Grasshopper in the 40’s. Wish I was able to see it up close but thanks for sharing. Neat sewing machine, thank you for sharing.